PLANTING POWERS, ACTIVATE! ACAD students tend to transplanted seedlings in the new greenhouse on the IDEA campus. the Deanwood community in Northeast. Students enrolled in the Academy of Construction & Design are nurturing seedlings that they hope will soon supply the school and the surrounding community with fresh fruits and vegetables. Spring onions, celery, pineapple, tomatoes and kale are sprouting up from flowerpots, after being transferred from the classroom to the greenhouse in late April. During this school year, 25 students have been working on the Youth Farmer’s Market project, now set to launch by mid-to-late July. 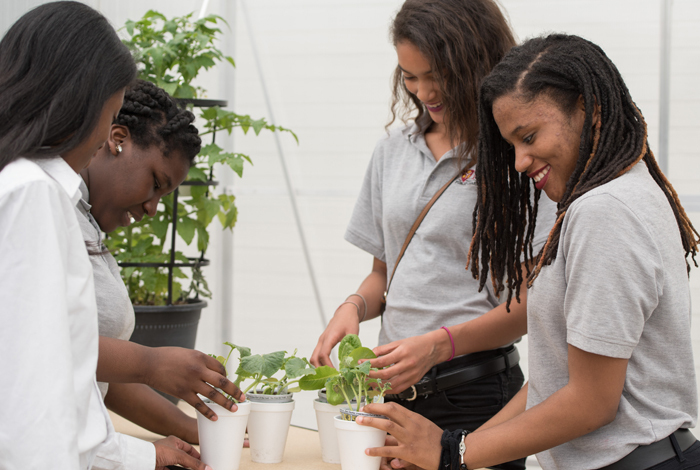 These budding gardeners are mostly ninth graders, in their first year at the Academy. “The plan is for the students to tend the plants and harvest this summer so we can take a stab at the Youth Farmer’s Market on Saturdays this summer,” said Shelly Karriem, director of the Academy of Construction & Design. While a tad behind schedule (the Youth Farmer’s Market initially planned to start in the spring), students are steadily prepping for the unveiling. They are watering the plants and constructing 10 planting beds built from cedar that will be placed on the IDEA campus. These boxes are being built from architectural plans Karriem found online. The beds will be the final home for these fruits and vegetables before being harvested for the market.